Are you ready to join me and the juicing community with your very first homemade juice? Great! Well the first thing you're going to need is an amazing juicer. I've put together a list below of my favorite juicers, all of which I own and use. From Entry Level to Mid Range to The Best, there's a juicer for every budget. 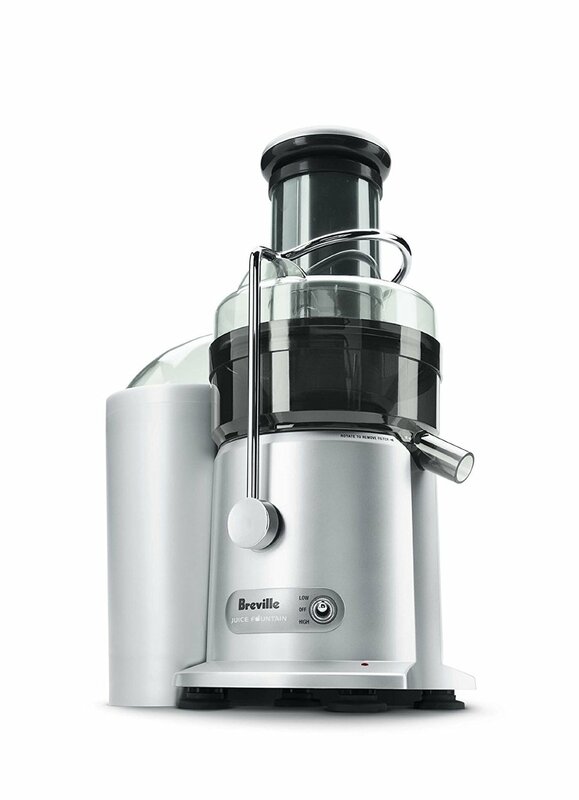 ENTRY LEVEL- For those who don't have much time and want to make juice on the go, the Breville is your choice. MID RANGE - For a masticating juicer that's easy to clean, the Omega is the best bang for your buck. THE BEST - For a twin gear masticating juicer that produces the highest quality juice, the Greenstar is your best option. Don't delay, get juicing today and join our community of over 225,000 juice lovers! Get into the world of juicing with this no-nonsense dual-speed juice fountain. Ideal for first-time juicers, this juicer runs on 850 watts and has two speeds, 12,000RPM or 6,500RPM, for hard and soft ingredients. Fruit is largely composed of water, but its selling point is its nutritional value. How do you extract the juice from fruit, without leaving the nutrients behind? Breville’s Nutri Disc and patented juicing system extract more nutrients than other juicers and transfers less than 1.8F of heat to protect enzymes and maximize nutrient absorption of select nutrients. This high quality juicer works fast for those on the go, and comes with an entry-level price. The Omega J8006 Nutrition Center is a masticating style juicer. Sometimes referred to as a low speed juicer, the Nutrition Center processes at 80rpm, whereas most other juicers process at a speed of 1,650 to 15,000rpm. The low speed protects and maintains healthy enzymes, prevents oxidation and allows juice to be stored up to 72 hours without degradation.The GE Ultem Auger is 8x stronger than most other plastics and the powerful gear reduction is equivalent to a 2HP Motor. The dual stage juice processing system extracts the maximum amount of juice from fruits, vegetables, leafy greens, even wheatgrass! The perfect mid range juicer. Greenstar machines are reputably one of the world's best juice extractors and most efficient food processors. Using Exclusive Jumbo Twin Gear technology with a low 110 rpm, ease of use and simple clean up, our Greenstar Juice Extractors and Food Processors are award-winning machines of unsurpassed quality. Independent laboratory tests confirm that the Greenstar's Twin Gear Press extracts a substantially higher quantity of minerals than leading juicers. Concentrations of essential minerals like calcium, iron, zinc are 50%-200% higher in juice from the Greenstar than from other name brand juicers. Now, your commitment to drinking raw juice can really begin to pay off!